Summer is here and all of us that have feet issues know it’s not all sunny. For years I have only been able to wear tie up shoes because I have these huge orthotic insets I have to wear. See I have plantarfacitis which is another way of saying I want to chop off my feet when I have been on them for a long period of time. Never fear oh plantarites (is that even a word?) I have found us a solution. Mobils shoes by Mephisto is the magic solution. I finally can wear sandals in the summer and feel normal. They are not only the best thing to hit our not so nice week but ladies, they are cute. So many different colors and styles. It can make a girl go mad. 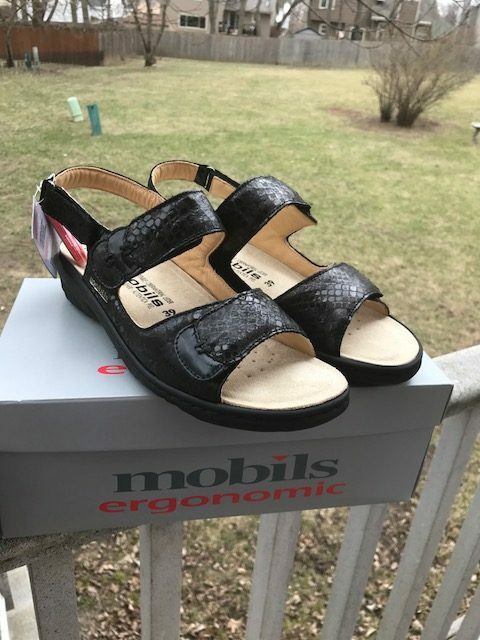 I was lucky enough, not only once but twice, get a chance to review a pair of Mobils sandals. I am totally in love. I have gone out and bought additional pairs. While they may take a little dent out of your budget, they are worth every single penny. I have worn them for days on end and my feet don’t feel like they are going to fall off. They are comfortable, stylish, and most important my darn feet can breathe in the summer heat. I highly recommend adding these to your closet space. So run fellow plantarites and find yourself these glorious shoes. Run now! Go!